So apparently David Bernstein and Mervyn King have left the board today! Why has this happened? I thought we had the boardroom sorted so we could get on with the management and playing staff? Not good news. The statement says Hollis is in extensive negotiations re the sale of the club, but that of itself shouldn't affect them until the sale happens. I hope not, but a guess is that something has happened which undermines what they have been doing. Could it be that they have a manager lined up (Moyes?) but the potential owner has totally different ideas? Points to Lerner being the root of the problem, for whatever reason. Maybe Lerner want's to keep our Mr. Villa. Or doesn't want to cost of sacking those remaining who caused our problems. How about Riley as Director of Football and Gabby as player-manager? When will this club sort itself out? 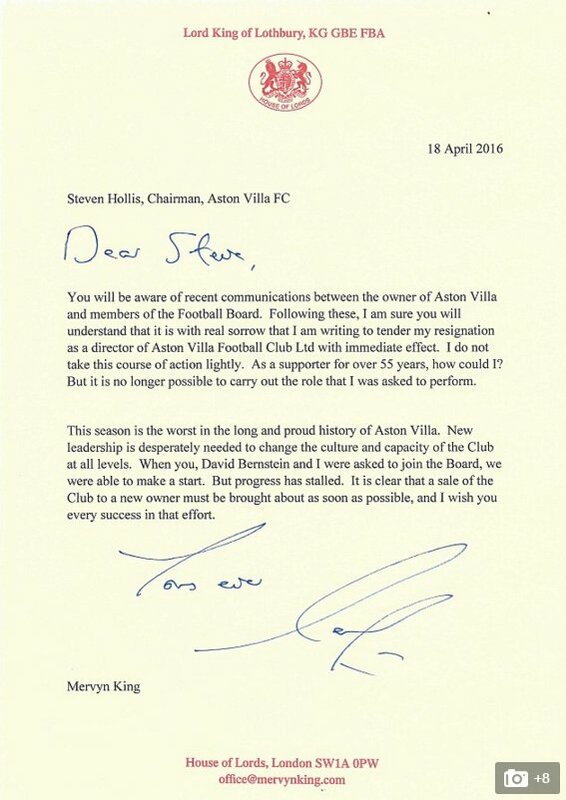 I, of course, have no idea what is going on, I just found out about the resignations, but for King especially, a lifelong Villa fan to resign like this must mean something is really rotten. Just as we thought that the future might look brighter as the board had been sorted, we take another 5 steps back. Odds on promotion next season just got longer for me. Shambles. Think Optimism has just gone off long term sick, with no guarantee it's not fatal. At this moment all thoughts/plans for next season are completely buried in the putrid smelly stuff. This could be a lot worse than just relegation. There may or may not be a new owner lined up, if so it could happen soon, a long way away, or not at all. And the owner could be anything from Lerner Mk 2 upwards. A complete and utter shambles. Whatever, it puts a complete stopper on sorting out the club and the squad. Do you think Gabby has had a word with Lerner? Do you still think we should stand aside and not criticise the players and others? Seems to me the only thing Mr Hollis has to do now is switch the lights off as he goes. What a f*mess you have created Mr Lerner. Now!!!!!! for sure we know why Martin O'Neil left. I rest my case, for the last 5 seasons I have defended his decision. its a complete farce now isn't it. ffs. we have to be the worst run club ever at this point - certainly in the modern era. Seems to be something like this. Bernstein and King do the job they were appointed to do, and come up with a plan to sort out the shambles. With relegation confirmed they are keen (aren't we all, very sensible) to get the manager position filled asap so that planning for next year can begin in earnest. However, before they can formally talk to potential candidates, they need to have agreed within the club both the new structure and the parameters under which the new manager will work (ie how much dosh he'll have), because those are the first things a potential manager will want to know before he starts thinking seriously about joining (note, I said formally; I just don't believe that no contact has been made with the candidates). So, they approach Our Owner. Randy says he can't answer these, he has some people interested in buying the club, and if he can sell the club he doesn't want any changes at the moment or to put any more funds in. Project Villa-Rescue hits the buffers big time. This sort of thing probably isn't that unusual when clubs change hands; Doug tied the purse strings in his final year, starved O'Leary of funds and put Bodymoor on hold. But we're not a club struggling but surviving in the PL. We're in a full-blown crisis which desperately needs the shambles in the club sorting out and the right decisions on manager and squad made, simply to avoid catastrophe next season. Randy shafted Garde in January. 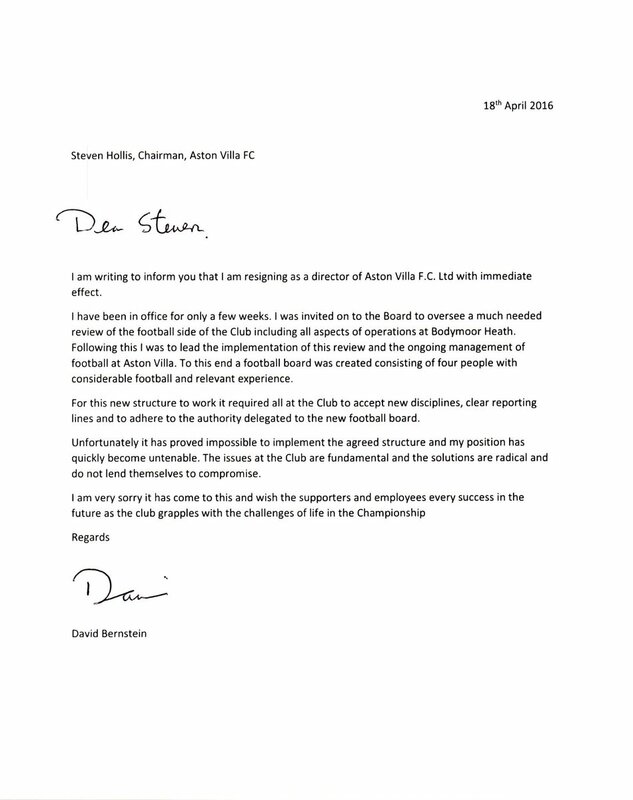 Looks like he's prepared to shaft the club, and the people he had to sort out of the mess, simply to get out of the club at minimal cost, whatever the consequences. The only hope, and it's remote, is that he sells quickly and whoever comes in can see what needs to be done. And we thought this season was bad. Interesting opinion McParland, but you don't hire people of that quality then not take their advice.It doesn't AGAIN!!! add up. No,I think our owner is set in his own ways and unless you sing along to his tune your out the choir.People like an O'Neil,Bernstein,and King aren't going to be pushed about,especially by someone who with respect has inherited the family silverware and is doing everything to reduce its value and possibly even lose it. I wouldn't trust him with a burger van. Hopefully one day the true story will come out why people keep ditching him. Well, it does add up if you think Lerner is hugely unable to handle any sort of significant business. His whole approach to appointing managers has always appeared strange, to put it politely, to give just one example. Bernstein and King clearly wanted a structure which could run the club as a football club should be run. It may not be the only possible structure, but you have to have something which works. Lerner treats the club like his own pet hobby.